Quick quiz for Leinster fans...can you work out for what match from days of yore the selection below represented the province? The answer is an infamous trip to Newport in 2009 where we lost 14 to 30. And although it was the week before the European “back-to-back” series just like Saturday's match, that's not the only way we can compare and contrast the two. From a nostalgia standpoint it can be fascinating going over those lineups…many were sadly forced to retire way too soon, and one even found a way to come back. And in the biggest irony of all, the ‘grandaddy’ of that matchday squad was none other than Bernard Jackman, who of course now coaches the Dragons although due to a recent ban he can only be at Rodney Parade in spirit for this one. 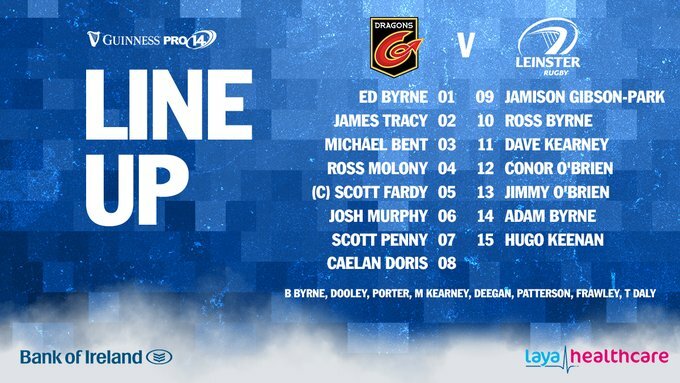 Now to have a look at the 2018 lineup, though it's worth noting that Dave Kearney appears on both team-sheets (as does Jason Tovey for the Dragons) albeit on the opposite wing. In many ways this looks like a lineup to reward those who performed well against the Ospreys, although if that's the case then it's tough on Ciarán Frawley who was named man of the match yet has made way for Ross Byrne. That said, Byrne's presence could be needed to calm any possible anxiety for this crop of young talent in what could be seen as a ‘tricky second album’ of sorts. Having watched the Men of Gwent defeat Edinburgh last weekend, I'm in no doubt that they have many threats around the park; for example Ollie Griffiths at number 8 was impressive in the loose and was man of the match, while Leinster fans may remember their full back Jordan Williams’ try at the RDS which was best of the night despite the blow out winning margin and he is capable of that at any time. They also get to welcome back some internationals, although the likes of Cory Hill and Ross Moriarty have been saved for the bench. The Dragons may be known as the ‘weakest’ of the Welsh regions, but this particular lineup would underestimate them at their peril. What we probably need most of all is a high level of security in set piece ball, and Messrs Molony & Fardy did very well with the lineouts last time out in particular. More of the same please! It's an interesting “all-O’Brien” centre pairing with Conor and Jimmy reuniting their Celtic Cup winning partnership; this will be a stern test for them. Despite the abundance of youth on show, Ross Byrne has loads of options like Conor's crash ball and Adam Byrne's talents under an attacking high ball. Finally the bench - after Hugh O’Sullivan impressed last week, this time it's Paddy Patterson wearing 21 and I sincerely hope that if he gets on the pitch relatively early it's because things are going relatively well for us! The bookies have us winning by 10…for once, I thought that to be a conservative spread but I suppose with home advantage plus more returning internationals it would be greedy to predict that we win by more, which means of course that I must! Replacements: 16 Elliot Dee, 17 Aaron Jarvis, 18 Leon Brown, 19 Cory Hill, 20 Ross Moriarty, 21 Tavis Knoyle, 22 Arwel Robson, 23 Adam Warren.